I don't think these cookies need a long introduction - they're delicious. 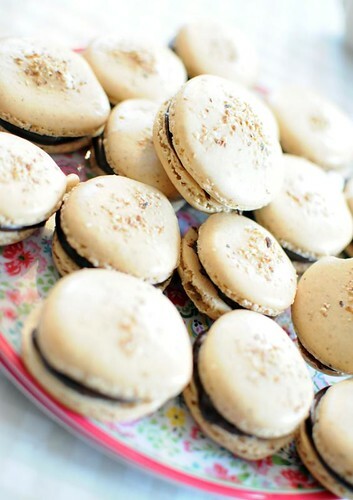 Using toasted hazelnuts instead of almonds is a great way to vary macarons and to make them more interesting. I'll have to experiment with other nuts as well - I've tried pistacio, but I'm thinking walnuts or pecans? Have you tried? These can be made with or without coffee, I've tried it both ways. And both are great. I think I prefer the non-coffee version, though. These particular ones were made when I had friends over for a macaron class a few weeks ago, and I might still have a few in my freezer. (Cookies - not friends.) Lucky me! Pipe small rounds on a baking sheet with baking paper. If you want, sprinkle some finely ground hazelnuts on top of half of them. Leave at room temperature for 30-60 minutes, to form a skin. Chop the chocolate finely and place in a small bowl. Bring the cream to a bowl and pour over the chocolate. Add coffee, if using. Stir until smooth. Leave the ganache to thicken slightly as it cools. If it gets too thick, heat briefly in the microwave. Fill the cookies, and store the finished macarons in the fridge where they'll keep for a few days, or in the freezer where they'll be fine for much longer. Åh, fy tusan, vad gott!! I tried to do that the other day, almost same recipes but it seems after those 10 - 15 minutes, they started to get a little bit brown but it was hard to remove them from the silpat wich i think it crazy! Also they broke too easily! Grr any idea? I love the idea of using walnuts etc!!!! Noelia, how annoying! I did notice these were more fragile, and I had some crack in the freezer. No problem getting them off the baking sheets though... Maybe something to do with humidity?